Food allergies are on the rise, now affecting about 1 in 13 children, and up 50% between 1997 and 2011 (source). With numbers like that, many grandparents are learning how to deal with food allergies due to a grandchild having an allergy, or a less severe but still problematic sensitivity. With food allergies, there is very little room for error. Even if it’s an accident, offering a child an offending food can cause illness, itchiness, or even a panicked trip to the emergency room with a life-threatening situation. 1. Focus on fun, not food. The easiest way to deal with food allergies is to avoid food-related things for entertainment You might have always dreamed of baking sugar cookies or taking trips to the candy store to spoil your grandchildren, but rather than trying to figure out how to make gluten-free cookies for the grandchild with Celiac’s, or identify which candies are corn and food-dye free for the child sensitive to corn and artificial dyes, it’s less stress and more fun to come up with new traditions. Buying a yearly pass to a local aquarium or children’s museum, teaching the grandchildren your favorite hobby, or flying kites together on every windy day are all wonderful ways to spend quality time and bond together. 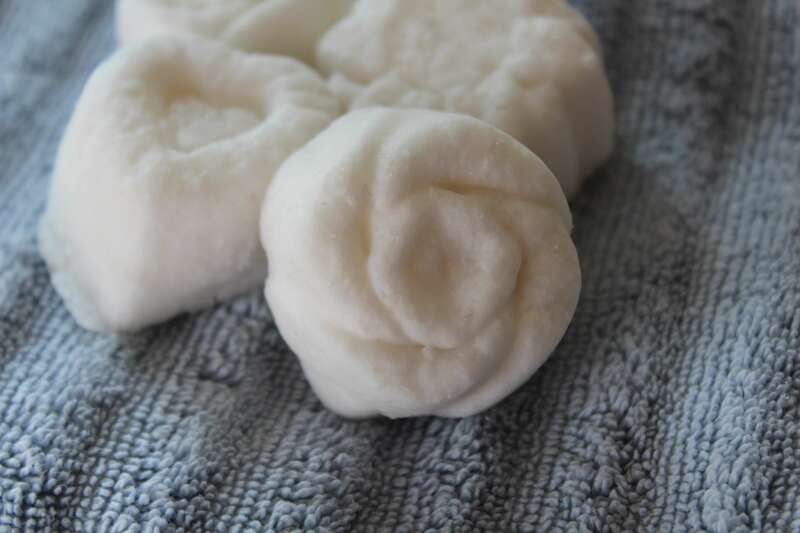 If you need more ideas, here are 12 more non-food treat ideas, you are sure to find a few things that you would love to do together. We are finding the connection between food and seemingly-unrelated health issues now, and it might be hard to understand at first. Food allergies don’t always require an Epi-Pen and Benadryl, but they are all very important to take seriously. When you are learning about your grandchild’s food allergy, ask for recommended website from your child or bonus child (son-in-law or daughter-in-law). Chances are that they can point you to as many helpful websites and online articles as you want, they’ve probably read them all too, in an effort to under stand their child’s unique nutritional needs and allergies. Allergies show up differently in different children, so understanding is the key to avoiding any food-related accidents that could cause illness in your grandchild. No matter what your grandchild’s symptom, communication within the family is helped drastically when everyone understands the allergy and asks for information when they need clarification. 3. Clear food out of everywhere but the kitchen. When you aren’t dealing with food allergies, food can be consumed almost automatically, and it’s natural to also offer food without thinking to anyone around you – including an allergic grandchild. All of those situations can create a crisis for a child with food allergies. To prepare for a grandchild’s visit, you can greatly minimize exposure to allergens just by having all food put away. Containers of nuts, crackers, or cookies on the counter. Candy bowls or cookie tins near the TV. 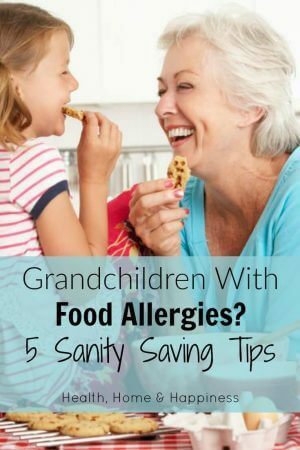 Depending of the severity of the allergy, how many food allergies there are, and how often the grandchild visits, it may be beneficial to completely remove the offending food from your home (like peanutbutter, peanuts, and peanut oil), or to have one area designated allergy-safe that the grandchild knows about. Fruit cups and fruit juice often have corn syrup and/or food dye in them. Fruit ‘snacks’ really aren’t fruit at all- and if the child is allergic to food dye or corn, they usually contain both. Yogurt raisins often have corn syrup in the coating, and are processed in a facility that also processes nuts- and even ingesting a tiny fraction of a nut that got mixed in during processing can mean a severe allergic reaction to a nut-allergic child. Packaged cookies, crackers, and baked goods may contain peanut oil, which is a huge problem for peanut-allergic children. Granola bars seem healthy, but they often contain dairy, wheat, and nuts- all common allergens. Dairy shows up in condiments like ranch dressing, dry cereal, chocolate, baking mixes, and even in some so-called ‘non-dairy’ toppings! 5. Don’t be afraid to request that all food be sent for the child. The parents may have forgotten how overwhelming it is to try to clear your house of allergens and come up with acceptable meals. When they give you a list of allergens, or even one allergen that is in many foods (like wheat or corn!) it may seem simple to avoid them at first, but once you start reading ingredients and looking at packages, suddenly it’s overwhelming. As the grandparents, this is all new to you and there is a learning curve, and it’s okay to ask for help. 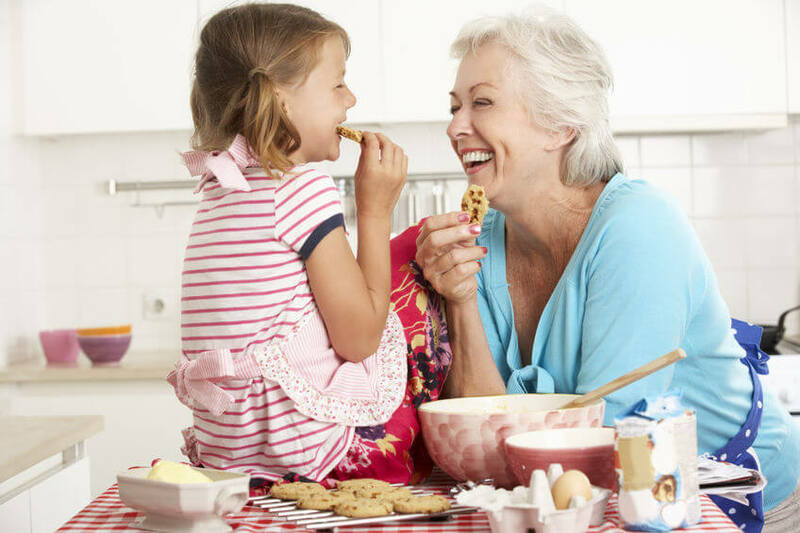 It might be helpful for them to send you Amazon links to snacks or food that you can have on hand that is always okay to give your grandchild, then you can ease their burden by having some ‘okay’ snacks specially set aside for the allergic grandchild. I agree, dealing with not being able to treat your grandchild to the kinds of foods that your own grandparents treated you to might be a bummer at first. But hopefully you now see how important it is to avoid offending foods, how you can focus on fun instead of foods during your visits, and how to avoid harmful accidents involving food allergies.